Hello Linux Geeksters. As you may know, Data Crow is an open-source media cataloger and organizer, enabling the users to manage all their collections in one product, by organizing everything into a huge database. Error message; full control needed for the install directory. This message was intended for the server installation only. The client doesn’t need this anymore with this version. Upgrade error in case the old images folder contains sub-directories. Fixed an error for the Audio CD and the Music Album merge. Performance issue for network clients has been fixed. No message box in case of a warning when deleting or saving an item (only message in the log file). New Item Wizard did not close after saving and view was not updated. Right-click in view, create report, added all items instead of the selected items. Error when creating report, invalid path for fonts, report was created though. An empty fonts folder will now be created by the installer. CSV import was no longer available. NullPointerException after entering wrong username / password. A faulty library has been removed. The library caused issues with the tree panels such as incorrect item counts or even preventing loading the items at all. Server could not run headless. Create multiple for music tracks did not show the track number field. Create multiple for music tracks; NullPointerException when adding tracks. Custom modules were not loaded. Server no longer requires the file importers, synchronizers and online services to be present (architectural change). TrueZip upgraded to the latest version (from 7.7.1 to 7.7.6). Image sizes have been increased as well as the quality of the thumbnails. Storage size will increase by approximately 20% due to this change. The wwwroot folder will be removed from the user folder. You might be asked to remove it manually in case it was not fully successful. Additional error handling for faulty modules. Changed the font size and color for the help files for better reading. Upgrade of the metadata-extractor library to the latest version. 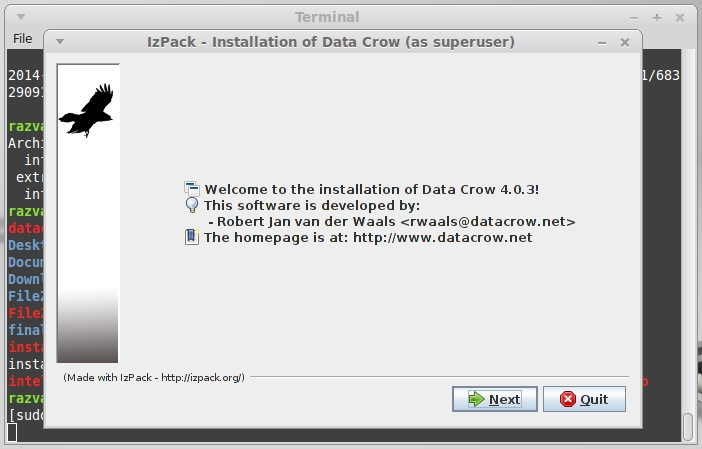 In this article I will show you how to install Data Crow 4.0.3 on Ubuntu, Linux Mint, Pinguy OS, Elementary OS, Deepin, Peppermint, LXLE, Linux Lite, Debian, Kwheezy, SparkyLinux, Crunchbang and other Ubuntu and Debian derivative systems. Next, we have to download the datacrow archive, extract it and run the sh installation script. Next, follow the installation wizard from the graphical user interface.